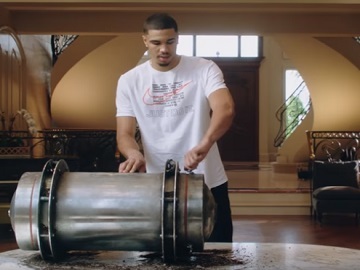 Jayson Tatum finds a time capsule from the ’90s in his backyard in the latest Foot Locker commercial, advertising the “Nike Air Origins” Pack, consisting of three new Air Max styles. Titled “Unearthing” and released with the #DiscoverYourAir hashtag, the spot features the Boston Celtics’ star as he discovers the content of the time capsule. “Dude, this is crazy!” he exclaims after seeing the items carefully placed inside the capsule, from a video tape, to a water gun and a note for him. Opening the shoe box that came in a Foot Locker shopping bag, he is delighted to see a fresh new pair of Nike Air Max Plus, part of the Nike Air Origins pack. “The era that inspired the shoe.” an onscreen line reads at the end of the spot, which also sees the tagline “Discover Your Air” flashing across the screen. Foot Locker and Nike have announced the launch of the new “Discover Your Air” campaign on August 23rd, also informing that this will serve as the creative platform for all Nike Air products and related content at Foot Locker. Nike Air “Origins” pack, which includes an Air Max Plus, Air Max 95 and Air Max 97, is available for purchase from August 23. A second collection, called Nike Air Frequency pack, which will also be comprised of Air Max Plus, Air Max 95 and Air Max 97, will be released on September 15. Both collections will be available across the Foot Locker family of brands including Foot Locker, Champs Sports and Footaction both in stores and online, including Eastbay.com.